While in college, cola was my caffeine source of choice. I tried coffee, but the taste never lived up to the smell and I couldn't get past the first two sips (one more to confirm the first sip). My first job after college involved going to neighboring farms for coffee after morning milking which was fun--except the whole 'coffee=ugh' thing. Instead I figured out that if I filled up my cup with milk and added a splash of tea for color I could choke it down politely. Ish. Therefore, I became a tea drinker. I am partial to the restorative powers of afternoon tea. I think of it as after school snack for grown ups. The amazing thing about tea is the variety of foods you can consume with a nice cuppa. Muffins are a favorite of mine [there's a whole category of muffins in that recipe index on my right sidebar]. 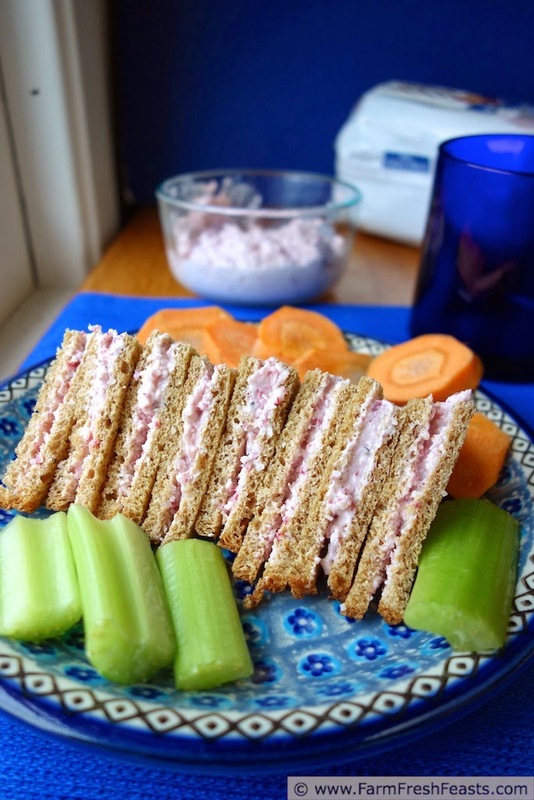 This sandwich spread is equally at home in an afternoon tea setting or a lunch plate. The spicy bite of the radishes and mustard is tempered by the cheeses for a lovely nibble. This was good spread on celery pieces and would probably be good on crackers. Combine in a food processor until well blended. Chill for an hour, or up to 4 hours. 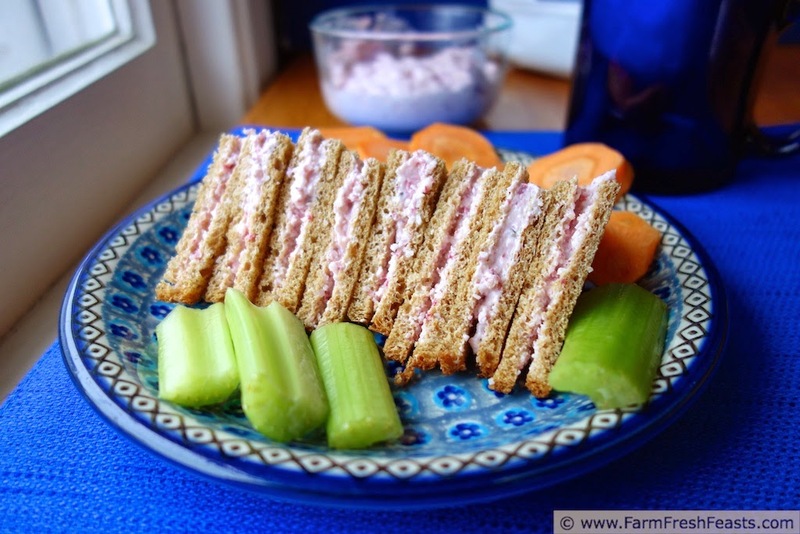 Spread on thin sandwich bread or crackers or vegetables, or use as a dip. Note: while this spread should chill for a while before serving, it only keeps about a day. After that it gets kinda weepy, so I recommend making just what you are planning to use that day. Lucky you for growing radishes! I helped the kids grow them when my kids were in elementary school, but I haven't tried it at home. These look great, Kirsten! I'm always shuffling through the pantry in the afternoon looking for a snack. This would be a much better alternative. I'm pinning this so I remember it when I have radishes on hand. Thanks for the pin! I seem to get hungry about an hour before my kids are home wanting an after school snack, so they benefit from my peckishness. 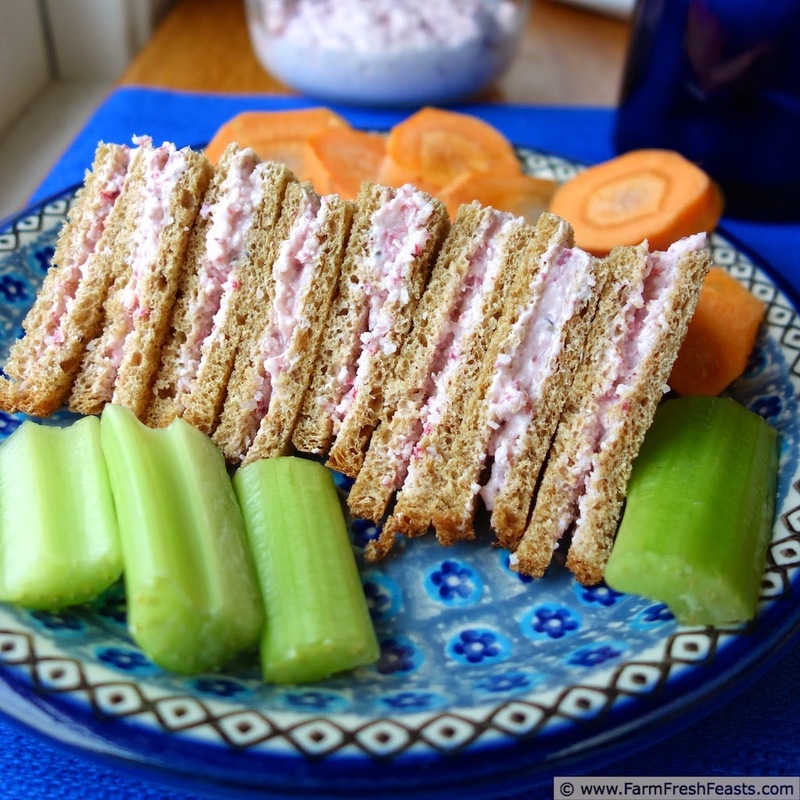 Great idea for a different sandwich filling! Thanks, Caroline! I'm always tickled pink (pun utterly intended) to figure out tasty ways to enjoy our farm share produce. This sounds delicious. I bet my daughter would love it! By the way, love your blog name. Mine is Farm Fresh Family. Yay for alliteration! I love your blog name! I was originally considering Farm Fresh Eating, but running it all together made it look like Heating and that just didn't work. Alliteration FTW! I curtsy in thanks for your praise of my dippiness! Nice pictures! I would definitely try those adorable little sandwiches. Okay, do your eyes water when you're chopping radishes or is that just me? My eyes don't water chopping radishes, but my throat closes chopping hot peppers--does that count? Most of the time the food processor is doing the work, so that may have something to do with it re radishes.